The Association enjoyed a successful year in 2018, although the work we accomplished amounted to damage control for an industry in trouble. 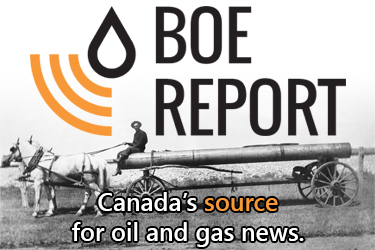 While the international oil and gas industry expanded market share to meet an increasing global demand, the sector in Canada remains mired in poor public policy and erratic leadership. To the extent the industry can determine its own destiny, we have succeeded in making significant headway. CAODC members still standing have found efficiencies they did not know existed, and have creatively managed to stay alive through an extended period of depressed day rates, sporadic and short-term work, large differentials, and steadily increasing costs. In 2018, the Association succeeded in working with provincial governments in Alberta and Saskatchewan on tax exemptions that amounted to substantial savings for members. While these savings likely did not amount to positive momentum, they certainly were valuable in maintaining stability, and I would like to thank both the Alberta and Saskatchewan governments for their cooperation on these files. Working with the GoS to remove the PST on depreciated assets entering the province. Working with the GoA to extend the carbon tax levy exemption to service rigs. 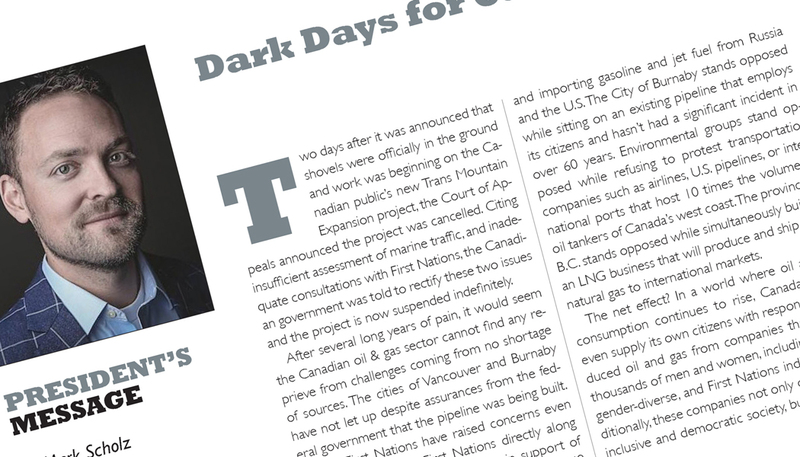 Continuing to lead the advocacy conversation through the Oil Respect campaign, educating the public on damaging legislation such as bill C-69 and bill C-48. 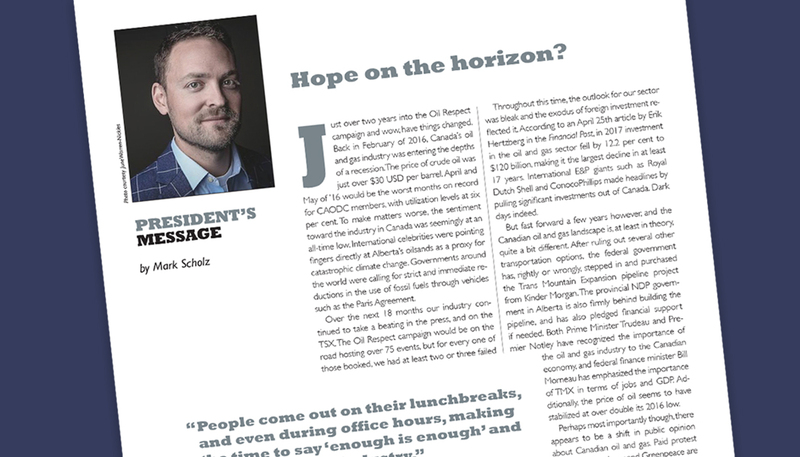 Continuing to challenge governments in Canada to recognize and respect the value our industry brings to all Canadians. 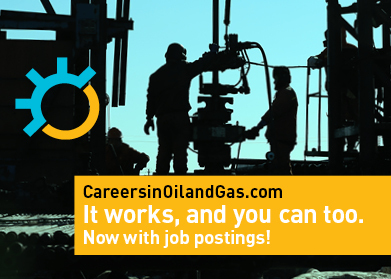 Successes aside, moving into the fifth year of this downturn, we’ve seen talent and equipment moving south at an accelerated pace, and the direction set forth for oil and gas in the United States has created jobs, opportunity, and wealth. Leadership in the US has made it crystal clear that energy independence, and a healthy oil and gas industry are a priority for all Americans. 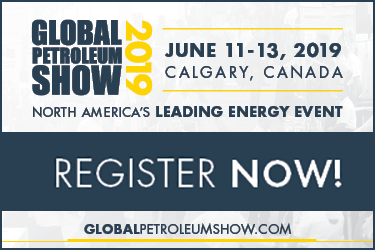 As a result, according to the IEA, US oil exports went from 16 million barrels in November of 2014 to 78 million barrels in December of 2018, and with that growth, the industry has recovered to 90 per cent of its pre-recession activity levels. 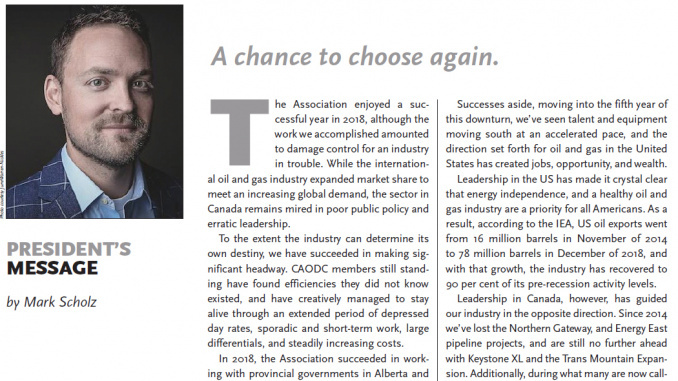 Leadership in Canada, however, has guided our industry in the opposite direction. 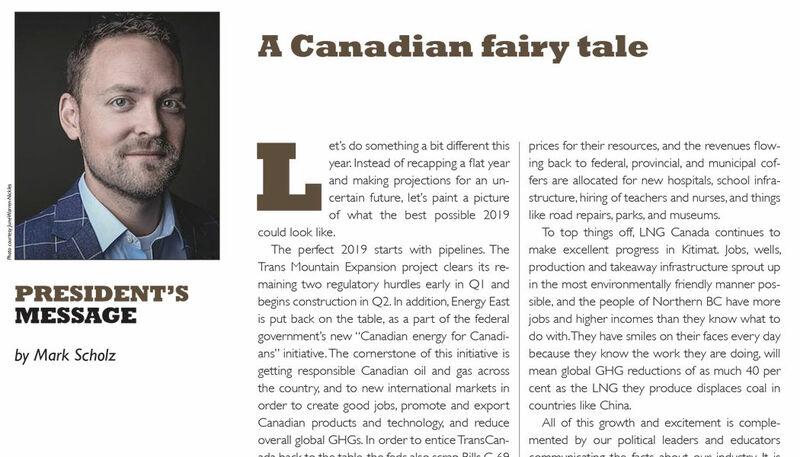 Since 2014 we’ve lost the Northern Gateway, and Energy East pipeline projects, and are still no further ahead with Keystone XL and the Trans Mountain Expansion. Additionally, during what many are now calling a recession even worse than the one we went through in the 1980s, the costs of doing business in our basin have steadily increased due to a sustained chorus of poor policy decisions. Two very different approaches with two very different results; and after four years of witnessing how important leadership is to our industry, in 2019 we have a chance to choose again. Whatever your political preference, I encourage you to educate yourself and others on the energy policies of all of the major parties, and choose the ones that best align with building the foundation for the future growth and development of Canadian oil and gas. This industry is at a crossroads. Our reputation as a legitimate oil and gas producing jurisdiction is eroding, and with each passing month, our infrastructure deficit compounds further and further. If we are to preserve any of what we have worked so hard to build, we need immediate federal constitutional leadership on projects that are clearly in the national interest. Our founding fathers gave the federal government the necessary tools to move forward on nation building projects, and we ask them to use these tools. Tone at the top has never been more important than it is now.